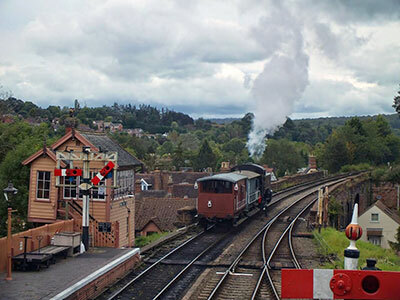 April 2019 Restoration update - Work on the boiler at Bridgnorth is progressing rapidly, while work at Bewdley has concentrated on completing as much of the cab area as is possible without the boiler in place, and on completing the vacuum and steam heat pipework under the loco. February 2019 Restoration update - Work at Bewdley during the winter has concentrated on the cab and bunker area (well protected from the weather! ), while at Bridgnorth firebox stay removal and reaming have been the priority. The web edition of the The 4150 Fund's 2019 Newsletter is now available. November 2018 Restoration update - We're pleased to report that the boiler is now inside the boiler shop at Bridgnorth and being worked on, initially largely by 4150 Fund volunteers. At Bewdley, we are concentrating on cab roof alignment and pipework. September 2018 Restoration update - With the boiler soon to enter the boilershop at Bridgnorth, work continues on the loco at Bewdley. July 2018 Restoration update - We are pleased to report that 4150's boiler has been successfully moved to Bridgnorth. Meanwhile, work continues on the rest of the loco at Bewdley. April 2018 Restoration update - With the boiler due to go up to Bridgnorth shortly, preliminary work on drilling out the steel firebox stays is progressing well. With the tanks, bunker and cab roof in place on the frames, as many cab fittings as possible are being trial-fitted, though those mounted on the firebox will have to await completion of the boiler overhaul. The web edition of the The 4150 Fund's 2018 Newsletter is now available. January 2018 Restoration update - with the boiler cladding now complete, we're catching up with various other items and fittings. October 2017 Restoration update - with the boiler and firebox cladding now virtually complete. August 2017 Restoration update - we've been concentrating on the boiler and firebox cladding. April 2017 Restoration update - the big lift! March 2017 Restoration update - preparation for the big lift. The web edition of the The 4150 Fund's 2017 Newsletter is now available. December 2016 Restoration update - with Seasons Greetings to all our supporters! September 2016 Restoration update - the side tanks reassembled ready for final riveting. April 2016 Restoration update - an update of recent progress on 4150 with the bunker very much on the home straight! Last year we asked for sponsorship to help with funds in anticipation of our boiler going to Bridgnorth boiler shop for overhaul. This has proved very popular and the team are very grateful and encouraged by your support . These items are still available, with some further additions. All items are permanent, very visible and can be identified from the platform. The web edition of the The 4150 Fund's 2016 Newsletter is now available. Peep Behind the Scenes 2016 - a date for the diary: this year's Peep Behind the Scenes will be held July 16th 2016. We've also updated the Share Application Form linked from the How to Help page. All new share applications will be most welcome as we prepare for the final big push - the boiler overhaul at Bridgnorth. July 2015 Restoration update - most of the construction works for the side tanks and bunker is now complete and we are now preparing the individual parts for riveting. Earlier this year we asked for sponsorship to help with funds in anticipation of our boiler going to Bridgnorth boiler shop for overhaul. This has proved very popular and the team are very grateful and encouraged by your support . Follow us on Twitter and keep up to date with the ongoing progress on 4150! Restoration update - a look at some of the detailed work in and around the side tanks. Restoration update - the side tanks are well advanced now. Our first Shareholders brake van trip on 30th August 2014 was a sell out. More trips are planned for 2015 which will be advertised to shareholders first. More video and photos from the day. Restoration update - continuing excellent progress with the construction of the side tanks. Restoration update - progress with the ongoing construction of the new side tanks. Restoration update - progress with the construction of the new side tanks. Restoration update - further progress with the construction of the new side tanks.